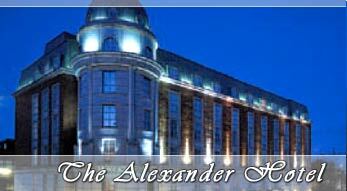 The Alexander is a stylish city hotel located in the heart of Dublin and within walking distance of the city’s Grafton Street shopping area, bustling night life and many other popular attractions. Guestrooms, decorated in contemporary style, offer state-of-the-art amenities and comfortable furnishings. Fine dining is available at Caravaggio’s Italian Restaurant, and the sports-themed Winners Bar is a lively place to enjoy a drink.